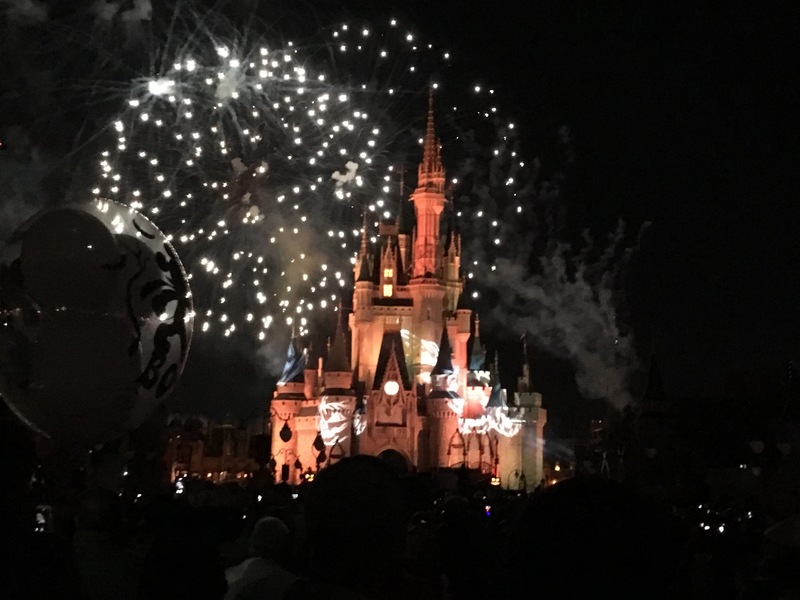 One of the things I was most excited to do on our recent WDW trip was attend Mickey’s Not So Scary Halloween Party. The party is a special ticketed event at Magic Kingdom that runs on select days from the end of August through to the start of November, and we actually attended the very last party of this year’s season on November 1st. Being a special ticketed event, one of the biggest selling points of the party is that it offers exclusive access to Magic Kingdom for the evening, while all other guests are booted out early, and runs up until midnight each night, so you’ve got a good amount of time to play in the park with a restricted number of guests. 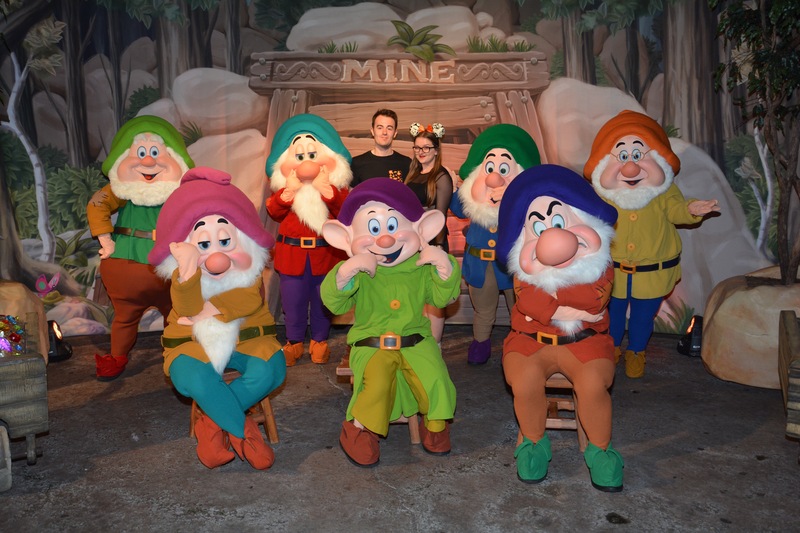 Other big factors for most guests are the rare character opportunities, and the fact that guests, including adults, are allowed to dress in costume for the party. Oh, and did I mention trick or treating?! The party runs from 7pm until midnight, but guests can enter the park from 4pm, and rather than heading down Main Street USA, you’re directed down a backstage route into the park, and along this path you’ve got a bunch of photo opportunities, but this is also where you’ll be given your trick or treating bag and your first handful of candy. Trick or treat spots are located throughout the parks, and each visit will gain you a huge helping of sweets and chocolate! The standard issue bags are fairly small and aren’t anything special in terms of decoration (ours was a plastic bag with adverts for upcoming films, nothing Halloweeny at all! ), so if you want something a little more fancy, you can bring in your own bag or bucket to use. 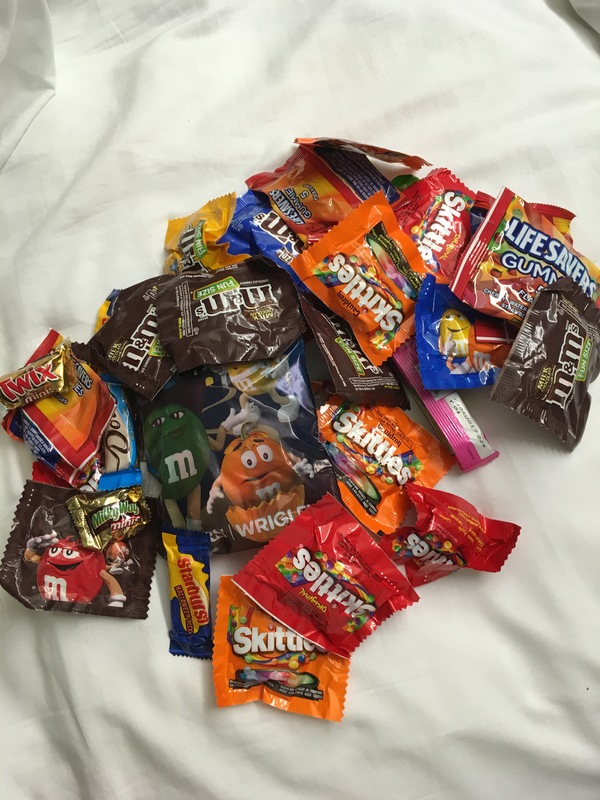 I would also definitely recommend that you don’t put anything valuable in your candy bag as its really easy to get them mixed up with someone else’s, or leave on a ride as Matthew did.. But don’t worry if you do lose your bag, just head to a trick or treat station and they’ll give you a new one! 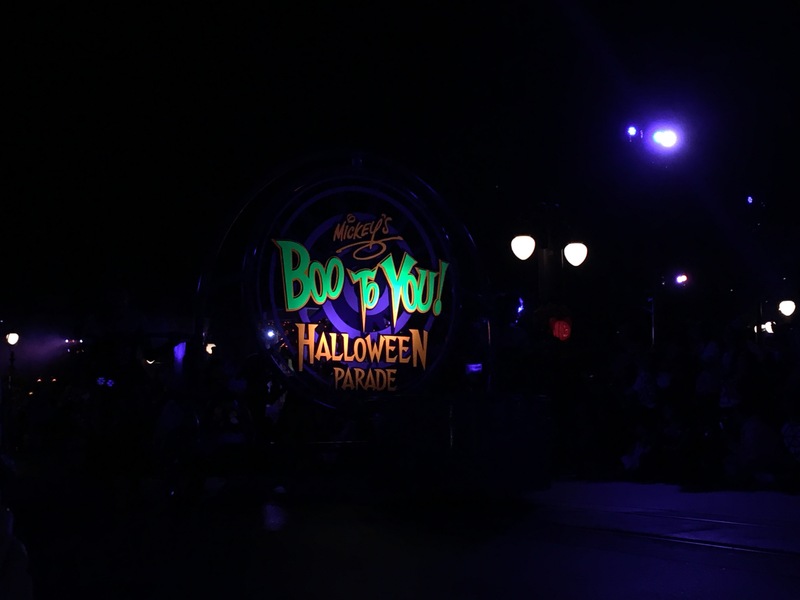 If candy isn’t your main priority, there’s a tonne of other entertainment for you, from the Tomorrowland Dance Party where I met Sully and Boo, to the Hocus Pocus Castle Show, Hallowishes fireworks and Boo to You Parade. As I’m not a fan of Hocus Pocus, we didn’t bother to see the castle show, but we did make sure we saw the fireworks and the parade. The night we did the party, the fireworks were only on once during the evening, which meant that it was very busy in front of the castle, but we still managed to get a decent spot on Main Street near the hub grass and despite not always being that impressed by firework shows, I really enjoyed them! Boo to You Parade is generally on twice each night, so we did the later one, which was a proven good idea as after the fireworks a lot of people started heading out of the park, and we decided to get in a spot straight away to ensure a good view and about 5-1o mins before the actual parade began, the Headless Horseman graced us with his presence as he rode down the parade route! 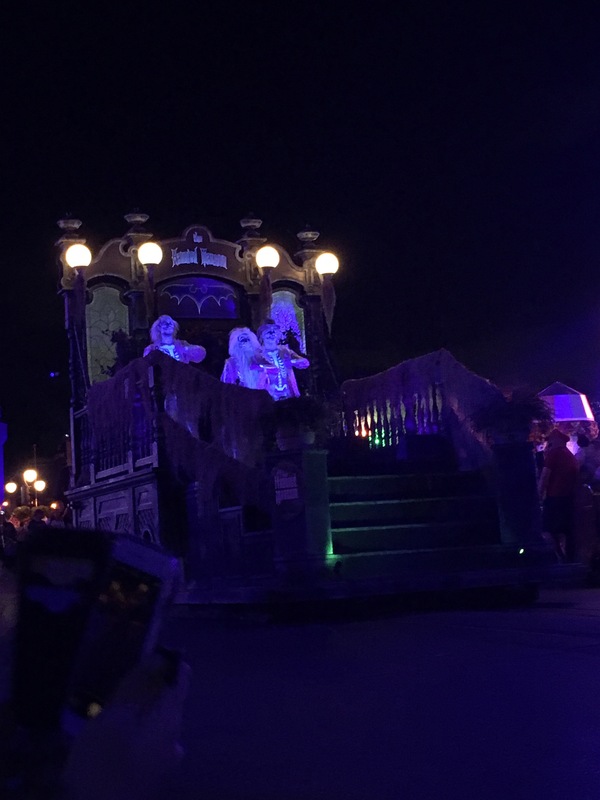 I’m a sucker for a parade, so of course I loved it, with my favourite floats being the Haunted Mansion and villain floats. And what characters can you expect to meet? Well there’s all your favourites dressed up in their very own Halloween costumes, and then some rarer appearances such as the Seven Dwarfs, Lotso and Jack and Sally, but be warned, these lines can be killer! We waited about 30 mins for Lotso, and just under an hour for the Seven Dwarfs, although I know people who have queued for a lot longer than that! Ticket prices vary from night to night, with October 31st being the most expensive at over $100 per person, but if you hit an early September weeknight, you can pay as little as $40-50 per person (prices based on 2017 tickets) so its definitely worth being flexible with dates if you can! Dates get released late April/early May and tickets go on sale mid-May normally. As someone who really isn’t a Halloween person, I had so much fun being not-so-spooky with Mickey! Its no secret that I’m pretty gutted I’m not going to Disneyland Paris for the Halloween Soiree, but I was really excited when the lovely Hannah from Courage and Kindness announced she’s be organising a Halloween gift exchange – kinda like a spooky secret Santa – I was so up for it! And while I sorted getting the gift for my recipient a few weeks before the deadline, I then promptly forgot about it, so when a mysterious parcel arrived with my name on it, I suddenly became super excited, and rightly so.. I received an amazing pile of goodies from the lovely Amber (@judddddddddd on Twitter) including some awesome Lion King socks, the Lush pumpkin bath bomb and a spooky black Yankee Candle, not to mention a huge amount of Halloween confetti which attacked me as I opened the package, haha! I was honestly so grateful for such a fabulous present! I was given Nicola to buy for – which was kinda perfect because she had me for Secret Santa last year! I wanted to keep to the spooky side of gift buying as much as possible, so I got Once Upon a Dream from the Twisted Tales collection as I know she’s a big Sleeping Beauty fan. I also found this amazing Disney Villians tote bag and topped it off with a semi-spooky Mickey Mouse design card from Redbubble. The whole thing was a lot of fun, especially as I don’t do much to celebrate Halloween! It’s also such a great way to bring people together, so a big thank you to Hannah for organising it! I’ve been waiting to post this outfit for AGESSS, and I finally decided that Halloween was the perfect time to share this villainous look. I’ve never really been one for Disney villains, but about 18 months ago the idea of this Ursula-inspired skirt came to me and I took to my sewing machine. About two days later, I had one finished skirt (or semi-finished, as I’ve never actually hemmed it!) and I’m so proud of it! If I was going to DLP for Halloween (which I’m pretty gutted I’m not to be honest), I’d definitely be packing this! As I think the skirt is the centrepiece of this outfit, I just paired it with a simple black crop top and chunky black Chelsea boots, and the lipstick is Winky Lux Stella Marina. This is also the first time I’ve been able to use my remote shutter control, meaning I’m finally in focus for a change, yay! Before you read on and think ‘hang on, there’s no pumpkin here’, I’ll explain. I had every intention of doing this post using pumpkin, but this Cinderella has a butternut squash patch in her back garden, and I decided to pick one of them instead! The recipe works exactly the same, yay winter mac and cheese! While the pasta is boiling, chop 400g pumpkin (or squash!) into chunks, and boil for 10-15 mins until soft. Once drained, put the pumpkin back into the saucepan, add 3 tbsp butter and 150ml milk and using a stick blender, blitz until smooth. You can also do this in a food processor. Add 100g cheddar and 1 tsp paprika and blend again, then stir in another 50g cheese. This can be stored in the fridge and reheated either in a saucepan or microwave, and is such a great winter warmer recipe! Its also a good way to get kids to eat veggies without noticing! I think I must be fairly odd as Halloween doesn’t get me all that excited; I love carving pumpkins but other than that I’m always just way to pre-occupied with the thought of Christmas coming to really get into a spooky spirit. I do, however, love making Halloween-y themed food, so I thought it would be the perfect time to post my third candy apple post! You’ll need 12-15 apples (I think green works best! ), 5 cups of caster sugar and 1 1/2 cups of water, plus some black food colouring (gel or paste), lollipop sticks, and black and white chocolate or candy melts. You’ll also need a candy thermometer! Start by mixing together the sugar and water in a saucepan, and get it boiling away. It needs to reach 150C, which will take a little while but you can use this time to get the apples cleaned and on their sticks. Once the sugar hits temperature, stir in the black food colouring, dip the apples and swirl them around to cover in the candy, then place on a tray covered in greaseproof paper to set – which will happen quickly! Now I can’t stress this enough: the sugar is HOT. We’re talking hotter than boiling water, so please please please be careful! This is definitely not an activity that children should be doing, even under supervision; its just not worth the risk of burning. Once the candy has set hard, you can start melting the white chocolate, and either dip the apples into it or spoon it on, and pop these into the fridge to set. When the white layer is hard, melt the black candy, and using a piping/ziploc bag with the corner cut off, pipe a spooky (or smiley!) face onto the apples and pop back in the fridge to let it set. These can be stored in a sealed container at room temperature for up to a week, so you can get them ready a few days before its time to get spooky! And if Jack doesn’t take your fancy, why not try my original Poison Candy Apples? Well happy Halloween folks, the spooky day is finally upon us! 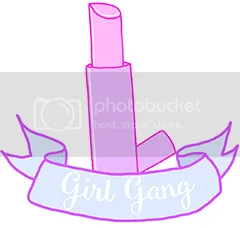 So I was tagged by the lovely Amy from Scariel’s Grotto to do this tag, and you can read her original post here! Well here we go.. I must admit I’m fairly pathetic when it comes to any scary movies, but I will admit Scream is a slight guilty pleasure of mine, if you can call it a Halloween film. Oh, and I loved The Little Vampire as a kid, must watch that again to see if its still any good.. If you were in a horror movie, how far would you get? I think this depends quite a lot on the movie.. I’m really not good with anything too scary, but I’m also really feisty so could definitely defend myself pretty well. What is your favourite memory of Halloween? It might seem silly, but Trick or Treating with my girlfriends when we were like 14? Our costumes were fairly weak and it was a totally silly night, but it was pretty great. I spent the majority of Halloweens as a kid dressing as a cat because I didn’t want to be a witch, and I recall one year I had a full on onesie-type costume to go to a friends party, and her kid sister had the same one which was hideously embarrassing, even if I was only about 10 at the time! Last year I made my own Maleficent horns, which I wore with a black starry playsuit and dark lipstick which I loved, even if it was just to stay at home with a broken wrist! As a kid my sister usually had Halloween themed birthday parties, and I remember we used to have this huge spider on our ceiling, which I’m fairly certain was made of bin bags but it was cool all the same. Oh, and fake cobwebs! I think I’d rather be faced with a vampire than a zombie in a scary situation, because vampires are far more civilised. Tough one.. I think dolls, cos at least they’re inanimate. I used to watch a lot of Ghost Hunters, the tv show, and some of the stuff they picked up seemed really conclusive, but I’m still not 100% sold.. I do think the energy of a person can hang around for a little while though. So that’s me! If you fancy giving the same questions a go, feel free, and drop me a comment so I can check it out! Now, go have a spooky-good day!